Thomas Jefferson High School has been around for more than fifty years, and many of our facilities have remained in vintage condition since being built. 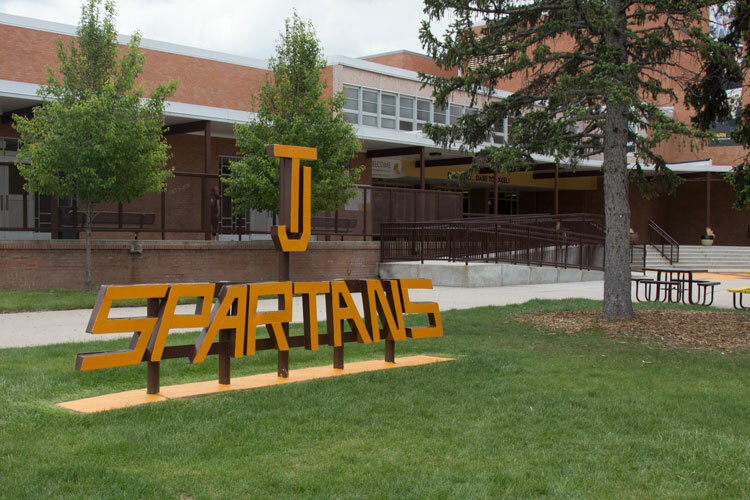 Thankfully, with the passing of a recent bond from DPS, Spartans can look forward to more than two million dollars worth of improvements in the near future. The process to get the funding was lengthy; the district first had to send out a notification to principals and facilities managers throughout the district, asking what pressing issues the school was facing. The school then had to request that a project manager come assess the issues that need to be addressed. Back in 2016, Denver voted on and passed the bond request from DPS, and while some schools had work being done on their campuses last summer, TJ will not see the full extent of its buildage* until the summer of 2019. Many of the facilities being updated were decided upon by the Design Advisory Committee (DAG), which was composed of principal Mike Christoff, our facility manager, students, and a contractor assigned by DPS. The main objectives of the modifications were to open up and brighten the school and affect as many students and community members as possible, regardless of pathway. Christoff said one of the most common complaints he hears from students is that, “the entryway to the school feels dark and uninviting.” Hoping to address this, the majority of the front office is being moved into a new section at the front of the school, increasing security and brightening up the walkway. In addition to this, both restrooms in the front of the school are being renovated along with the spirit shop, which will serve as a concession stand as well. The pillars in the hallway outside of the auditorium will border new trophy cases that will replace the hexagonal, hanging one that is in the middle of the lobby currently. The inward facing wall of the lunchroom will be replaced with glass, as well the inner wall of the library upstairs. The entire library is being converted into a more student-centric lounge, with plenty of outlets for charging phones. The library will also be receiving sky lights, bringing in more natural light to the hallways, as well as multiple study rooms and a presentation room. Last, but not least, a bathroom and concession stand building will be put behind the softball field. Unfortunately for the juniors, the majority of the work being done is not going to occur until the summer of 2019, but there are some minor changes that soon-to-be seniors will be able to utilize. In hopes of improving the health of our students and community, TJ will be adding three more water bottle filling stations throughout the school, reducing the trek to get to and traffic at the sole filling station currently in place. Another addition greatly appreciated by many of our spring and fall athletes is a renovated turf field. Both of these projects will be finished over the summer of 2018 and will be greatly appreciated throughout the community. *Editorial note: “buildage” is not a word, but in this case, it felt right.